When I started blogging back in 2009, I had a good idea of how I wanted to monetize my site, what I was going to write about, and how I planned to execute it all. But even though I had a clear-cut plan in place, I still made a lot of rookie mistakes. Not only did these blogging mistakes decrease my earning potential, but they also slowed down my overall growth and traffic. 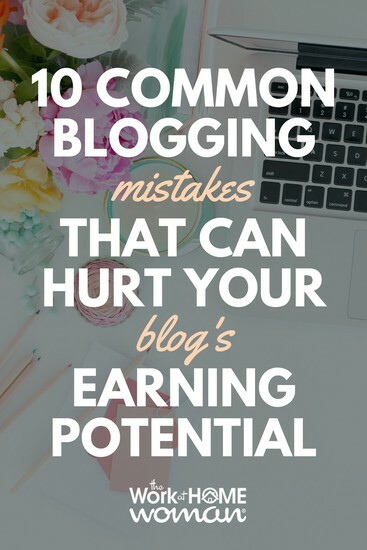 If you're serious about making money with your blog here are some common blogging mistakes and how you avoid them on your own blogging journey. When I first started blogging, I had very linear thinking when it came to blogging monetization. However, I quickly learned that if I was going to make it as a blogger, I needed to diversify my income streams. Which meant that I needed to think and act more like a marketer. Since all of my content is free on the site (even my blogging e-book), I had to figure out ways to turn my free content into money. So I included other revenue streams like affiliate marketing, paid sponsorships, and working with an ad network to my repertoire. Along with adding additional revenue streams, I also looked at how I could monetize each post and include a clear call-to-action when I wanted the reader to take action. Another area I failed in was connecting my target audience to products and services that THEY needed, not me. All too often, I would try to promote parenting and baby products, because that's where I was at in my life — a new mom. But, once I turned it around and started promoting things my audience needed, my sales and income increased. Always remember, it's not about you — it's about your reader! A word of caution. You need to be judicious with what you’re promoting, as well as you need to fully disclose your relationship if you’re gaining financially from it. Your relationship with your readers will always be your bread and butter, and without trust and respect, you’ll lose readers, traffic, and in the end money. I first learned about this in Holly Klaassen’s e-book, 50 SEO Secrets for Mom Entrepreneurs (which is no longer for sale). You probably know that when another website links to your content, it’s good for your SEO, because Google awards “link juice” (think about this as a vote of confidence in your content). The more “link juice” that you have, the higher Google ranks your content in the search results – which ultimately means more organic traffic to your blog. But did you know you can give your own site a little “link juice” by interlinking your own content? What this means in plain English is, that you link keywords and phrases in your most current blog post to older content on your blog. Not only is this good for SEO, but it keeps visitors on your site longer, and makes it more likely for a conversion to be made. Since I neglected interlinking when I first started blogging, I had to go through my old blog posts and interlink them, along with updating outdated content and adding images. It’s never too late to update and refresh your content so that it makes money for you. While I had loose goals in my head on what I wanted to do with my blog, I didn’t have clear-cut, concrete, goals written down on paper. Because I didn’t have a written roadmap in place, I wasn’t able to monitor what I was doing. Flying by the seat of my pants worked to a point, but it didn’t allow me to take my blog to the next level. 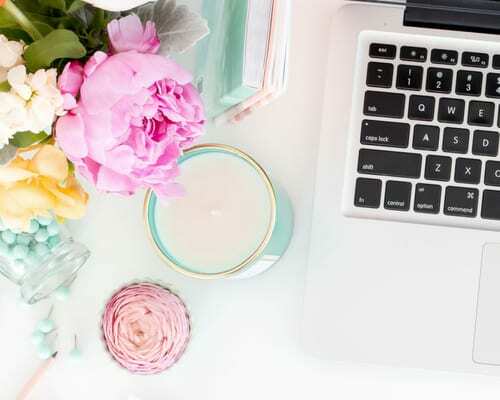 As a blogger, you need to think like a businesswoman, which includes having a marketing plan and learning how to evaluate your promotional efforts. This also holds true for your financials, set specific monetary goals and create a plan on how you’re going to achieve them. If you don’t have these in place you’ll plateau and become discouraged – you may even decide to throw in the towel, which happens to a lot of bloggers. When I first started blogging, I figured I didn’t need to use images with my blog posts due to the professional and educational nature of my niche. After all, what was I going to take photos of … my desk? It’s not like I was traveling to exotic locales that would make for good scenery. And stock photos? Too expensive for a new blogger on a budget! But what I quickly learned is that humans are visual creatures. One image alone can evoke thousands of emotions – just look at the success of the visual social networks like Pinterest, Instagram, and Flickr. Having images in your blog post can help to grab a reader’s attention, enhance and break up your text, as well as support your point. It’s also been shown that social media updates that contain images tend to be shared and liked more (which means more traffic to your blog). Having images is also good for your SEO (remember to use your alt tags), and photos make your blog look more professional. Look at any popular blog on the web, and there’s one thing that you’ll notice – great formatting. While I wasn’t terrible at this aspect when I started, my blog posts definitely needed some improvement. Let’s start with the basics, writing for the web is different than writing for print. Many readers are generally searching for a specific answer to a question or problem, which means their time is limited, so it’s important that you get to the point quickly. Make your articles scannable by using sub-headers, bullet points, and numbered lists. And remember to include lots of white space and short sentences and paragraphs. Large chunks of text mean individuals have to sift through lots of information to find what they’re looking for. Make it easy on your readers to find exactly what they’re looking for. By having information that is well presented, you keep readers on the site for a longer period, as well as repeat and word of mouth visitors. And more visitors equal more traffic, which means more money. Search engine optimization, commonly referred to as SEO is an algorithm that awards points to websites and blogs that have incoming links from reputable websites; the more reputable the site, the more points that are awarded. These points are then added up and used to determine the value of your site, which directly correlates to how much organic (free) website traffic you’ll receive from Google and other search engines. To keep the algorithm fair, Google requires that publishers (bloggers) place the no-follow attribute on advertorial, affiliate, and sponsored links. This way the link will not be awarded any points, because it is paid for and unnatural. Now here’s where it gets tricky, even though advertisers know that this is the rule, they will still ask you to place a do-follow link on their ads — because it helps their SEO efforts. Now here’s where it gets ugly, should you choose not to follow Google’s rules and they find out, they can remove your website from their search engine results. This would kill your traffic, as well as your blogging business. Bottom line, don’t accept short-term gain over long-term growth and profitability. Blog giveaways are big business, both for bloggers and brands alike. But did you know that there are very stringent laws and tax implications in place for running giveaways? First, I highly suggest reading Mom Blogging for Dummies, where Wendy Piersall consults an attorney for details on legally running giveaways, contests, and sweepstakes on your blog; which by the way, are all very different. Once you have the basics down make sure your promotional methods aren’t violating any social media rules. For instance, many bloggers run giveaways where they make entrants “like” their Facebook page, or the brand that they're working with. This is a violation of Facebook’s promotional rules, and if you are caught, your Facebook page could be deleted, as well as the brand that you’re working with. Just because everyone else is promoting giveaways in this manner doesn’t make it alright, act with integrity and follow the rules. Lastly, if you choose to run a giveaway on your blog, you must award a prize, even if the sponsor does not follow through. I’ve personally had to pay out of pocket for prizes that were not delivered upon by the sponsor. While the prize itself does not have to be the same item, it does have to be the same value. Running a giveaway is a contract between you and your readers, make sure you follow through all the way to the end. Failure to do so can affect your reputation, fan base, and earning potential. Recently, I had a blogger email me about guest posting on the site. After tossing a few emails back and forth, I sent her all of the requirements, appropriate topics, and told her to submit her article for review when she was ready. Upon reviewing the article, I found that many of the guidelines had not been met, as well as her article was filled with typos and errors. I kindly replied, letting her know that I would not be able to use the post. She emailed me back with a very nasty and ugly response, which I did not respond to. This sort of behavior is NEVER okay. No matter what the situation is, you always need to act with integrity. If you’re feeling frustrated by an email or situation, take a time out and cool down, respond when you’re feeling less agitated. Or perhaps you need to ignore the situation altogether. As they say, don’t burn your bridges, because you never know when you’ll need to cross them again. When I first built my website, I used a graphic designer to help me with the custom design. For the first couple of weeks she was very responsive, but as time went on the less responsive, she became, until she stopped responding altogether. This, of course, left me in a bind, as I had to find someone else to complete the work that I had already paid for. I’ll never know why this designer left me high and dry, but I’m fairly certain she was having issues at home (which I would have understood). To this day people ask me who designed the site, but because I had such a bad experience with this designer, I obviously can not refer work to her. When you give a delayed response (or no response at all), it tells people that you don’t care and that you don’t value their time. Answering queries promptly and honestly, can help make you stand out from the crowd, as well as convey a sense of concern and trustworthiness. Always remember to respond to people in the manner you wish to be treated yourself. It feels good to be approached by brands and companies; it means you’re in demand. And who doesn’t want to make money with their blog?! But there is a fine line between relevant partnerships and advertising, and selling out your integrity. When you do the latter, your audience loses trust in you, and over time this can seriously hurt your blogging business. So how do you keep from selling out? First and foremost, always trust your gut. If a partnership or advertising campaign doesn’t feel right, don’t accept it. Stick with products and services that you love and use. And always remember to disclose the nature of the relationship, as well as promote in moderation. Nobody wants to visit a blog jam-packed with ads, sponsored posts, and affiliate links. Honestly, this is a short list of blogging mistakes that you can make. The web is constantly changing, and as a blogger, you'll need to stay on top of the latest news, trends, and updates to ensure that you're running your business lawfully and with good intention. I highly suggest joining some Facebook blogging groups so you can stay in the loop and have a like-minded tribe of bloggers to bounce questions and ideas off of — in fact, that should be blogging mistake #11 — not having a blogging tribe. What are your thoughts? What are some other common blogging mistakes that make bloggers look unprofessional? What mistakes have you made along the way? Drop us a note; we'd love to hear from you! Originally published December 11, 2013. Content updated October 10, 2018. I just graduated from college and I’m on vacation. I’m thinking about starting a blog business. Along with these mistakes, I wanted to know about another thing. How many blogs, e-commerce blogs, blog startups (blog businesses, e-commerce blog businesses, blog startup businesses) can I run at a time and make money from? How little money do I need to get started and how do I get started? You can start as many blogs as you like, however, blogging takes a lot of time, so I would suggest one or two max. Thank you for the tips – I haven’t done a giveaway before, but wasn’t aware of those requirements (and I feel like many bloggers may not be!). Thanks for sharing your expertise. Glad you enjoyed the tips, Lauren! Thank you for this post. I was intrigued by the image on pinterest. You are so right. I’ve been very uncomfortable with “growing” my blog the way others are suggesting. It seems pushy, blatant, and sometimes obnoxious. I want people to follow me because what I post resonates with them, not because I’ve coaxed them in with some blingy bribe. Glad you enjoyed the article, Dawnita.